Summary Single band N router with 10/100 ports based on a Broadcom N Router SoC. 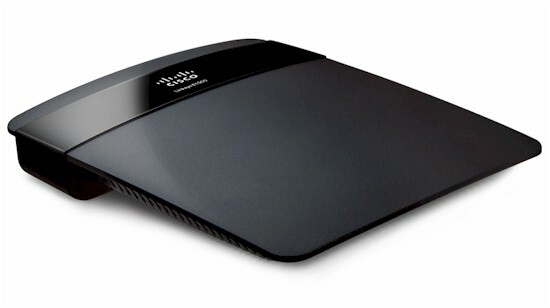 The E1500 is the first of Cisco's revamped Linksys E series to hit the SNB test bench. It's a straightforward single-band 2.4 GHz N router that is one step up from the entry-level E1200. Its black plastic case features what I've dubbed the B&O (Bang and Olufsen) styling with no visible lights on the topside. Although it looks like it would nicely wall-mount, there are no mounting screw slots on the bottom, so it's meant to sit nice and flat on your desk or bookshelf. As the table below shows, the extra $20 (MSRP) is supposed to buy you extra radio performance, with an extra receive antenna to boost receive gain (2x3) and separate amplifier(s) to boost transmit power. The single WAN and four switched LAN ports are all 10/100 and there is no USB port for drive or printer sharing. Cisco is temporarily blocking inside photos of the new E series. So I opened the test sample up to see what makes it tick. You can clearly see the Broadcom BCM5357 Intensi-fi XLR 802.11n Router Solution that does pretty much everything, including CPU, 10/100 WAN port, four port 10/100 switch, wireless BB/MAC and 2.4 GHz transceiver. 32 MB of RAM and 8 MB of flash are in their own packages. The BCM5357 also has an "integrated 2.4 GHz power amplifier that has been proved in the field on shipping production platforms". But the E1500 has separate 2.4 GHz outboard amplifiers under the soldered-down RF shield—two SiGe 2528L 2.4 GHz power amps, I suspect. I also suspect when I open up the E1200 that's waiting for review, I'll find it also uses the BCM5357, has no RF can and one less antenna. All the usual Linksys routing features are present, so there is nothing new to report there. Note that support for IPv6 still is missing from the admin interface. Routing throughput running the latest 1.0.00 build 9 firmware and our router test process measured 93 Mbps WAN to LAN and LAN to WAN and 120 Mbps total with up and down tests running simultaneously. The IxChariot composite plot below shows upload speed around half download in the simultaneous routing test. The Maximum Simultaneous Connection test indicated support for 8K (8192) simultaneous sessions. The E1500 is Wi-Fi Certified and properly defaulted to 20 MHz bandwidth mode on power-up. I successfully ran a Wi-Fi Protected Setup (WPS) session with my Win 7 client by entering the WPS code found on the E1500's bottom label. The WPS session completed (although it took longer than I've seen with other products) in a WPA2/AES secured connection. As is my new procedure, all tests were run with this secured connection. Wireless performance was generally unimpressive and in some cases below that of the E1000 that both the E1200 and E1500 are replacing. Highest 2.4 GHz throughput of 63.7 Mbps was measured using our wireless test process in Location A running uplink with the client set to Auto 20/40 mode. I've included the E1000 in the Wireless Performance table below so that you can compare the two. The E1000 seems to generally do better running uplink than the E1500. If the E1500 represents a step up in wireless performance from the E1200, then Cisco may have taken a step backwards from the E1000 in price / performance with both products. You can further explore the E1500's performance and compare it to other products using the Router Charts. Since the E1500's feature set is well known, there will not be a full review.